Year 2 pupils enjoy a visit from the local fire brigade! 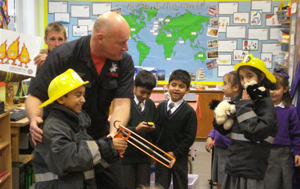 Year 2 pupils were thrilled to welcome in the local fire brigade to learn all about safety with fires, how to use extinguishing equipment and to react quickly to danger. Smoke alarms were inspected and fire uniforms were donned! It was a really educational day and the children loved the interaction with our special visitors. There were important lessons for life learned in a thoroughly fun, memorable, Billinge House way!